Piper auritum, also known as the Mexican pepper leaf or root beer plant, is an herbaceous invasive weed native to Central and South America. It was introduced into Florida in 2013 where it has spread throughout the southern counties. It is also present in Hawaii. This weed spreads rapidly and quickly displaces other plants in the ecosystem, making it a significant threat to natural areas. It is difficult to kill due to its ability to grow from any plant part, including rhizomes, stems, and cuttings. If discovered, the entire plant should be destroyed immediately by burning or chemical application. Plant debris should also be cleared to prevent new weeds from growing. 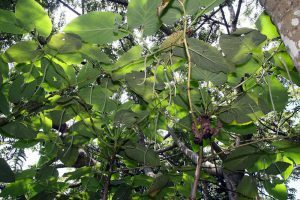 P. auritum can be identified by large leaves (20-50 cm) which have unequal lobes at the base. When crushed the plant emits an anise-like smell. More information about this weed can be found at the Invasive Species Compendium species page.